For any retail referral service, where each retail individual business location is billed utilizing Turnkey billing. 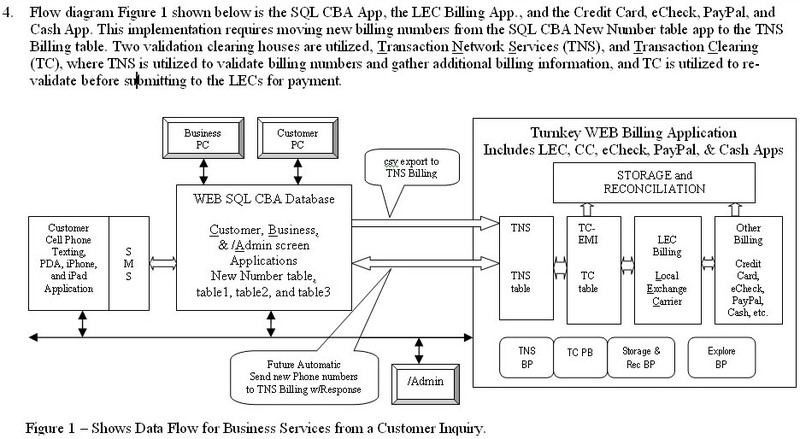 The billing types include Credit Card, eCheck, PayPal, Local Exchange Carrier (LEC), and Cash. Turnkey billing for Services provided to each retail remote location. This Billing service is best utilized for retailers with a large number of remote locations. This Service is billed monthly. The service validates each billing number, accumulates additional address information for billing. We bill this large retailer at each business remote location utilizing their phone number. This billing service Submits monthly billing utilizing Credit Card, eCheck, PayPal, LEC, or Cash for payment. Provides monthly billing reconciliation reports. Third party services may submit their billing to this Turnkey WEB service.